This post is a bit overdue, but I am only getting to it now because I have been gone so much over the last month working on my new book that I have a bit of a backlog of posts. 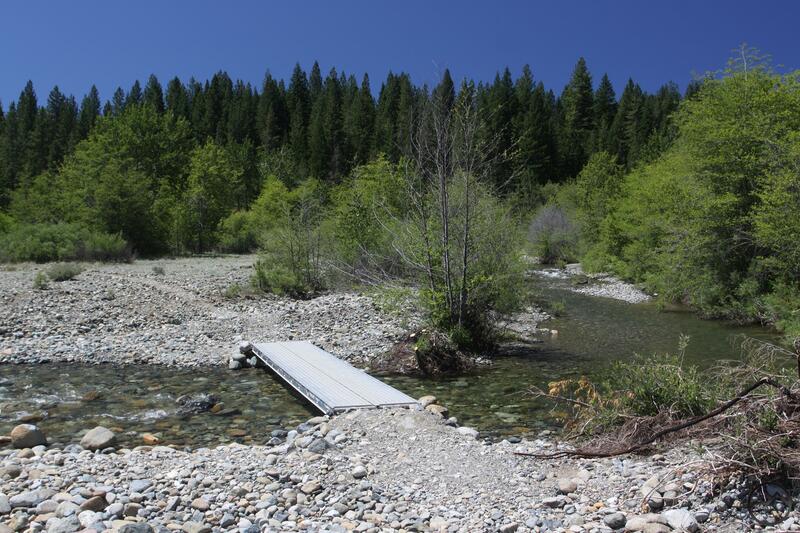 The last time I posted to the blog, I highlighted a new section of the Lake Siskiyou Trail that had been completed by the Mount Shasta Trails Association. Now I can follow it up and note that the seasonal bridges across the Sacramento River at the lake’s inlet have been installed and the loop around the lake is complete. This presents the new opportunity to circumnavigate the lake, staying near the water the entire time and enjoying the peaceful new addition along with all the other great parts of the trail. This really is a gem of a trail and a huge asset to the Mount Shasta area. When I popped over to the lake to check on the conditions, I was surprised with how much debris had accumulated around the river. Snags, root balls and other forest detritus littered the rocky floodplain. Aside from all the debris, a couple of other things are worth noting. The bridge over the south channel has not been installed. The the river dammed during high water a couple winters ago and the channel and it is now dry. It is easily crossable on foot and the old foundations are still present, marking the spot where the bridge was crossed the river. Also, wood and rock have been used to demarcate the trail across the inlet area’s rocky terrain. This is the case from the south channel all the way to the bridge over the north channel. However, once across the bridge there is no discernable trail and it is necessary to find the bridge over the secondary channel hidden in the lush riparian vegetation. It is not a big deal, it requires a little heads up. It is interesting to note that the river is still up to its old tricks regarding its seemingly constant channel-changing. I most recently related this activity here and here. In the past, the water’s path was once consistent enough that the trail was built in permanent fashion. It has now, over the last couple of years, proven to be extremely flexible in which way the water flows and any permanent trail route seems unrealistic since channel has been altered significantly the last couple of winters. The bridge is located in roughly the same spot it was last year but where there was once a shallow gully through the rocks has been deepened considerably. If some of the debris along the banks was removed it would make a wonderful swimming hole. The river has also decided to make use of two paths, where earlier this year it flowed only through the primary one. I was surprised by how much of the water was running underground, disappearing beneath the rocky floodplain. It will be fascinating to see how the Sacramento continues to alter the land over the next winter. Looking north across the bridge. Looking south across the bridge. The new swimming hole adjacent to the bridge. Site of the former south channel bridge. Part of the river is siphoned off into an alternative channel. A significant portion of the river runs underground. The river is winnowed down to a narrow channel. They just installed the bridges for 2017!